Although the focus is on basketball, some elementary students attending the NJCAA Division II Men’s National Basketball Tournament in Danville Wednesday got another treat. They were shown some reptiles that are kept on campus, including a tortoise, king snake, leopard gecko and a python named ‘Junior’. 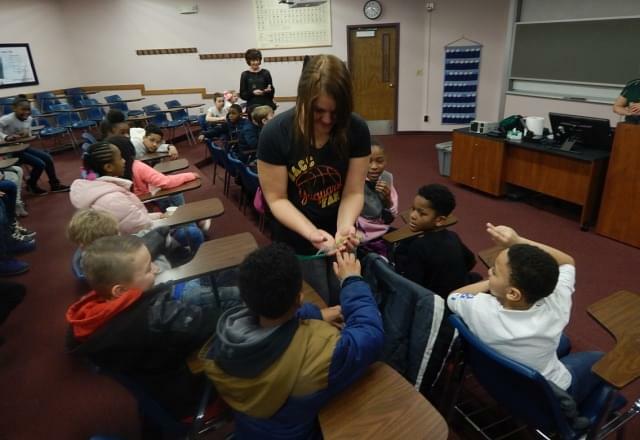 Dr. Wendy Brown told the 4th grade students from Danville’s Edison Elementary School the snakes shed their skin three or four times a year. And with the python wrapped around her body (see photo), Dr. Brown said the students might think the snake was squeezing her. But instead, she said ‘Junior’ the python was merely trying to hang on. 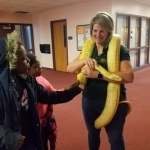 Dawn Nasser, an Academic Advisor at Danville Area Community College, walked around the room giving the students an opportunity to see the reptiles up close. Nasser is a member of the Entertainment Committee for this year’s NJCAA Tournament which is being played this week at the community college. Of course the students also got to witness some of the action during Wednesday’s first-round basketball action at the tournament.